The generals have taken over the country, and they want the people to be happy about it. 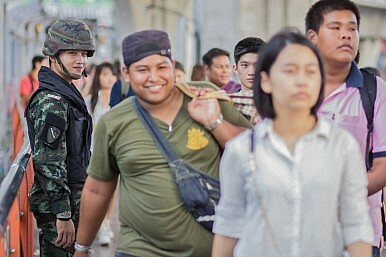 Thailand’s coup regime is handing out freebies to prove its sincerity in bringing happiness back to the country. First, it arranged live broadcasts of all 64 World Cup matches on Thailand’s free TV. Then it lifted the night curfew in more than 20 provinces, allowing football fans and tourists to watch the games after midnight. Earlier, the army set up numerous reconciliation centers across the country in a bid to end the conflict between warring political forces. Believing that reconciliation will only work if people are relaxed, Army General Prayuth Chan-ocha ordered recreational and entertainment activities to be held at the centers. “Happiness” festivals were meanwhile organized at popular protest venues like the Victory Monument in Bangkok, where soldiers offered free haircuts, food, massages, and medical checkups. Army officers also entertained the crowd by putting on concerts. To promote patriotism, the junta also announced the free screening of The Legend of King Naresuan, a film about a revered leader who defended and expanded the reach of the Thai kingdom. A proposed train fare hike in the nation’s capital was also delayed to ease the financial burden of the people. “We need to solve many issues; from administration to budget system, corruption, and even the starting point of democracy itself – the election. What we are doing today is to try and bring everything back to normal. We intend to return happiness to everyone living in Thailand, both Thais and foreigners,” he added. Since day one of the coup, the army has banned protests and public gatherings of five or more people. Despite this prohibition, however, many Thais continued to organize creative forms of protest actions like the “Hunger Games” three-finger salute to represent the people’s aspirations for genuine liberty, equality, and fraternity. The salute has since been outlawed. Meanwhile, the junta continued to summon hundreds of Thais suspected of being critical of the army. But army officials insisted that those being ordered to report to the army are not being detained, since they are provided with amenities like “air conditioning” and “good food.” In other words, the dissenters may have been stripped of their civil liberties, but they are able to enjoy the amenities offered by the army. This depiction of Thailand’s “happy detainees” says a lot about the country’s coup in general A military dictatorship has taken over the country and the generals want the people to be happy about it.